Miami » Blog » Water Damage Restoration » Water Damage Miami: Beware of the Plumbing Gremlins! Water Damage Miami: Beware of the Plumbing Gremlins! If you grew up in the 80s or you are just a retro junkie, you may recall the 1984 hit film ‘Gremlins’. In this comedic horror movie, Gizmo the Mogwai is accidentally exposed to water and spawns these diabolical little clones who, in turn, eat after midnight and transform into evil green monsters with razor-sharp teeth. In this film, water is something that a responsible Mogwai-owner must keep vigilant watch over. Just ask any water damage Miami company if homeowners should give their water and plumbing the same attention one would in a house with an occupant Mogwai, and they will clearly confirm that maintaining a healthy home requires initiating a yearly checklist of routine water-related maintenance tasks. You wouldn’t keep your Mogwai in the same room your fish tank is in, right? Nor should you allow water to flow through pipes that are beginning to crack or bulge, otherwise you will be phoning your local water damage Miami technicians for emergency water damage restoration services due to a pipe burst flooding your bathroom. Just ask any water damage Miami pro if destruction has been caused by water damage that seems small on the surface, and they will likely have an arsenal of stories. Leaking or dripping faucets, shower heads and fire sprinklers are responsible for causing various stages of water damage like rot to your hardwoods and the moisture can compromise the condition of your drywall and carpets. Remember in ‘Gremlins 2: The New Batch’ when a drinking fountain malfunction sprayed water onto the floor and struck little Gizmo resulting in hundreds of Gremlins destroying a large building? Even a small amount of water can settle into the cracks between your floorboards and cause rot or warping. How can we forget the scene from ‘Gremlins’ in which Billy’s mother goes upstairs to discover a den of mold left from the moisture that seeped out from the Gremlin’s cocoon bursts? These maniacal little monsters caused one heck of a problem requiring mold removal services. Like these crazy creatures, water too can cause mold to prosper indoors. Mold calls for damp conditions in which the air is humid and there is little to no sunlight or air circulation. Like mold, sunlight will kill Gremlins, so if water splashes out into a dark area, and our Miami weather is at its typical humidity levels, you may be in for quite the toxic mess! When Stripe, the leader of the Gremlins dipped his finger in the fountain to replenish the town with his sadistic offspring, Billy exposed the creature to sunlight killing it. When mold or water damage has occurred the conditions must be changed to reverse the process that caused the warping and rot. Professionals use the top water extraction equipment and the latest drying technology to remediate such chaos. 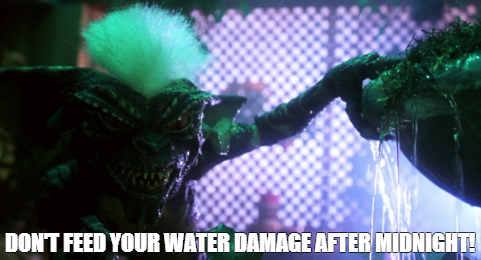 Next time you watch ‘Gremlins’ think about how you can keep those little water damage Gremlins from destroying your home that you work so hard for!